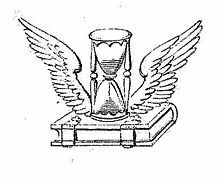 There are no records of the hourglass existing in Europe prior to the Early Middle Ages, such as invention by the Ancient Greeks; the first supported evidences appears from the 8th century CE, crafted by a Frankish monk named Liutprand who served at the cathedral in Chartres, France. 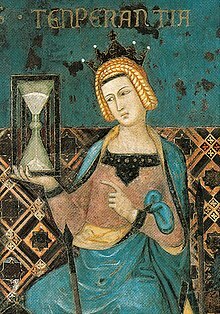 But it was not until the 14th century that the hourglass was seen commonly, the earliest firm evidence being a depiction in the 1338 fresco Allegory of Good Government by Ambrogio Lorenzetti. The hourglass also found popularity on land. As the use of mechanical clocks to indicate the times of events like church services became more common, creating a "need to keep track of time", the demand for time-measuring devices increased. Hourglasses were essentially inexpensive, as they required no rare technology to make and their contents were not hard to come by, and as the manufacturing of these instruments became more common, their uses became more practical. After 1500, the hourglass was not as widespread as it had been. This was due to the development of the mechanical clock, which became more accurate, smaller and cheaper, and made keeping time easier. The hourglass, however, did not disappear entirely. Although they became relatively less useful as clock technology advanced, hourglasses remained desirable in their design. The oldest known surviving hourglass resides in the British Museum in London. Not until the 18th century did John Harrison come up with a marine chronometer that significantly improved on the stability of the hourglass at sea. 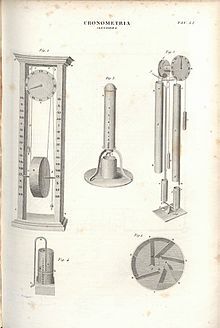 Taking elements from the design logic behind the hourglass, he made a marine chronometer in 1761 that was able to accurately measure the journey from England to Jamaica accurate within five seconds. Little written evidence exists to explain why its external form is the shape that it is glass bulbs used, however, have changed in style and design over time. While the main designs have always been ampoule in shape, the bulbs were not always connected. The first hourglasses were two separate bulbs with a cord wrapped at their union that was then coated in wax to hold the piece together and let sand flow in between. It was not until 1760 that both bulbs were blown together to keep moisture out of the bulbs and regulate the pressure within the bulb that varied the flow. While some early hourglasses actually did use sand as the granular mixture to measure time, many did not use sand at all. The material used in most bulbs was a combination of "powdered marble, tin/lead oxides, and pulverized, burnt eggshell". Over time, different textures of granule matter were tested to see which gave the most constant flow within the bulbs. It was later discovered that for the perfect flow to be achieved the ratio of granule bead to the width of the bulb neck needed to be 1/12 or more but not greater than 1/2 the neck of the bulb. Hourglasses were an early dependable and accurate measure of time. The rate of flow of the sand is independent of the depth in the upper reservoir, and the instrument will not freeze in cold weather. From the 15th century onwards, hourglasses were being used in a range of applications at sea, in the church, in industry, and in cookery. 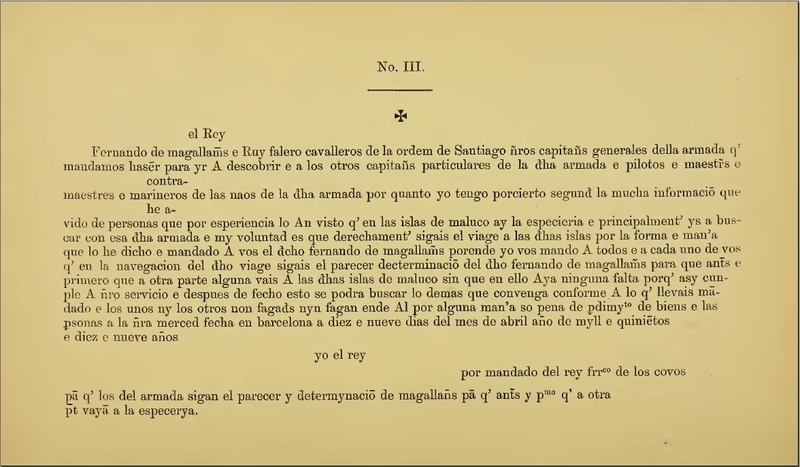 During the voyage of Ferdinand Magellan around the globe, 18 hourglasses from Barcelona were in the ship's inventory, after the trip had been authorized by King Charles I of Spain. It was the job of a ship's page to turn the hourglasses and thus provide the times for the ship's log. Noon was the reference time for navigation, which did not depend on the glass, as the sun would be at its zenith. A number of sandglasses could be fixed in a common frame, each with a different operating time, e.g. as in a four-way Italian sandglass likely from the 17th century, in the collections of the Science Museum, in South Kensington, London, which could measure intervals of quarter, half, three-quarters, and one hour (and which were also used in churches, for priests and ministers to measure lengths of sermons). The sandglass is still widely used as the kitchen egg timer; for cooking eggs, a three-minute timer is typical, hence the name "egg timer" for three-minute hourglasses. Egg timers are sold widely as souvenirs. Sand timers are also sometimes used in games such as Pictionary and Boggle to implement a time constraint on rounds of play. Because of its symmetry, graphic signs resembling an hourglass are seen in the art of cultures which never encountered such objects. Vertical pairs of triangles joined at the apex are common in Native American art; both in North America, where it can represent, for example, the body of the Thunderbird or (in more elongated form) an enemy scalp, and in South America, where it is believed to represent a Chuncho jungle dweller. In Zulu textiles they symbolise a married man, as opposed to a pair of triangles joined at the base, which symbolise a married woman. Neolithic examples can be seen among Spanish cave paintings. Observers have even given the name "hourglass motif" to shapes which have more complex symmetry, such as a repeating circle and cross pattern from the Solomon Islands. 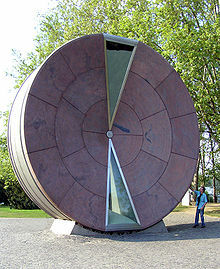 Both the members of Project Tic Toc, from television series the Time Tunnel and the Challengers of the Unknown use symbols of the hourglass representing either time travel or time running out. ^ a b F.J.Britten (190x). OLD CLOCKS AND WATCHES & THEIR MAKERS. LONDON, B. T. BATSFORD, 94 HIGH HOLBORN. pp. 16 and 249. ^ Orton, Fred; Wood, Ian; Lees, Clare A. (2008-02-01). Fragments of history: rethinking the Ruthwell and Bewcastle monuments. Manchester University Press. ISBN 9780719072574. ^ a b c d e f Mills, A.A.; Day, S.; Parkes, S. (1996). "Mechanics of the sandglass" (PDF). European Journal of Physics. 17. pp. 97–109. Bibcode:1996EJPh...17...97M. doi:10.1088/0143-0807/17/3/001. ^ Frugoni, Chiara (1988). Pietro et Ambrogio Lorenzetti. Scala Books. p. 83. ISBN 0-935748-80-6. ^ a b Anthony John Turner (1993). Of Time and Measurement: Studies in the History of Horology and Fine Technology. Ashgate Publishing Company. ISBN 978-0-86078-378-7. ^ a b Nicolas, Nicholas Harris (1847). A History of the Royal Navy, from the earliest times to the wars of the French revolution, vol. II. London: Richard Bentley. p. 476. ^ a b c d Balmer, R.T. "The Operation of Sand Clocks and Their Medieval Development." Technology and Culture, Vol. 19, No. 4 (Oct., 1978), pp. 615-632 Balmer, R. T. "The Operation of Sand Clocks and Their Medieval Development." Technology and Culture, Vol. 19, No. 4 (Oct., 1978), pp. 615-632. ^ Pigafetta (1874). The First Voyage Around the World, 1519-1522. Hakluyt Society Press. pp. A12. ^ Bergreen, Laurence (2003). Over the Edge of the World: Magellan's Terrifying Circumnavigation of the Globe. William Morrow. ISBN 0-06-621173-5. ^ "Four-way sand glass, Italian, 17th century, image no. 10325648". The Science Museum. Retrieved 1 November 2014. ^ Senate of Australia (26 March 1997). "Official Hansard" (PDF): 2472. Archived from the original (PDF) on 29 April 1998. ^ Herbst, Sharon Tyler (2001). The New Food Lover's Companion. Barron's Educational Series. ^ Room, Adrian (1999). Brewer's Dictionary of Phrase and Fable. New York: HarperCollinsPublishers. "Time is getting short; there will be little opportunity to do what you have to do unless you take the chance now. The phrase is often used with reference to one who has not much longer to live. The allusion is to the hourglass." ^ Ewbank, Thomas (1857). A Descriptive and Historical Account of Hydraulic and Other Machines for Raising Water, Ancient and Modern With Observations on Various Subjects Connected with the Mechanic Arts, Including the Progressive Development of the Steam Engine. Vol. 1. New York: Derby & Jackson. p. 547. "Hour-glasses were formerly placed in coffins and buried with the corpse, probably as symbols of mortality—the sands of life having run out. See Gent. Mag. vol xvi, 646, and xvii, 264." This page is based on the Wikipedia article Hourglass; it is used under the Creative Commons Attribution-ShareAlike 3.0 Unported License (CC-BY-SA). You may redistribute it, verbatim or modified, providing that you comply with the terms of the CC-BY-SA.